Product code: ES7549 Categories: Sold Items, Sold Rings. Simply perfect for any occasion, comes this antique diamond ring made in 1900 in 18ct yellow gold that would suit any finger including making a very sweet and charming antique diamond engagement ring. 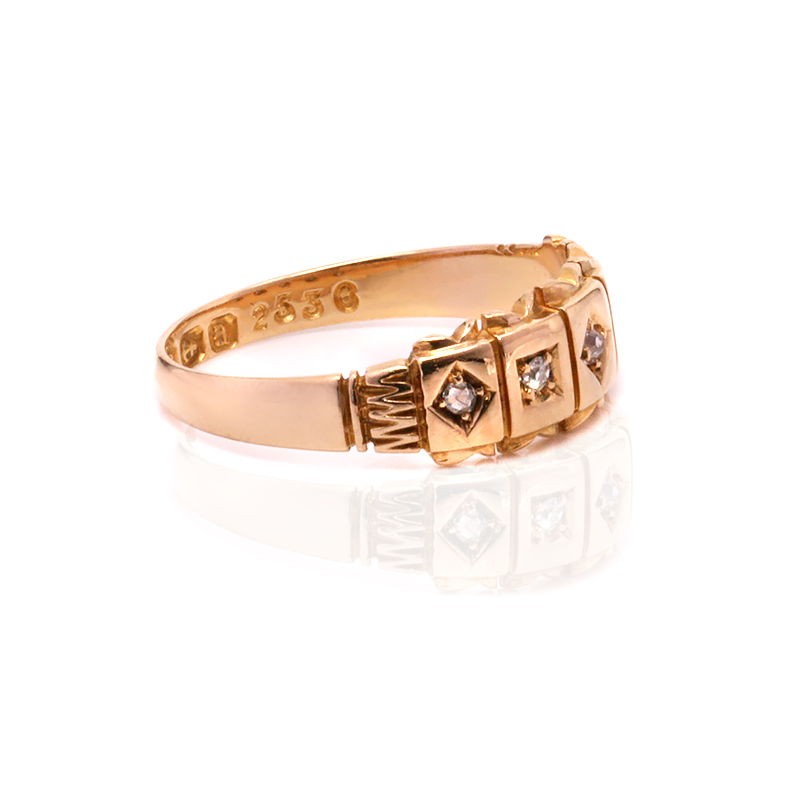 Not only does this ring have a very unique design, in the individual box setting for each of the diamonds, the diamonds at each end and the middle diamond are set into boxes in a lozenge shape and in the second and fourth diamond, the settings are square. And to add to the unique charm and character of this ring, the three larger diamonds in the centre are European cut diamonds and the diamonds at each end are rose cut diamonds. In total the diamonds weigh 0.09 carats and from one end diamond across to the other, this distance measures 16.2mm by 6.5mm wide at the centre and as the diamonds are set into the band, this gives it a very smooth feel to it. This is such an attractive antique ring that is not only in wonderful condition well after 100 years have passed, but also looks as beautiful today as when it was made. Antique diamond ring made in 1900 in 18ct yellow gold that would make a perfect engagement ring. Set with three European cut diamonds and two rose cut diamonds at each end, this is such a comfortable ring to wear all the time. Antique engagement rings have such a wonderful charm and character to them that are made even more special when set with genuine antique cut diamonds.